DJ's California Catering offers a wide range of choices for you to fulfill your beverage service needs. Our experienced bartenders are charged at an hourly rate. DJ's Catering will supply a wide selection of call and premium liquors, with mixtures and garnishes, to make traditional and popular cocktails. No need to worry about how much to buy and what to do if you buy too much or too little. Our expert staff will provide unlimited service of your favorite cocktails throughout your event for one convenient charge per guest. Are you looking for convenience and simplicity? DJ's Catering Hosted Beer & Wine Package provides just that. We will add a selection of domestic and imported beers as well as a selection of popular wine varietals. Champagne is available upon request for the bar and for the traditional toast at your wedding reception. Pricing is set per person and includes unlimited service for a set number of hours. 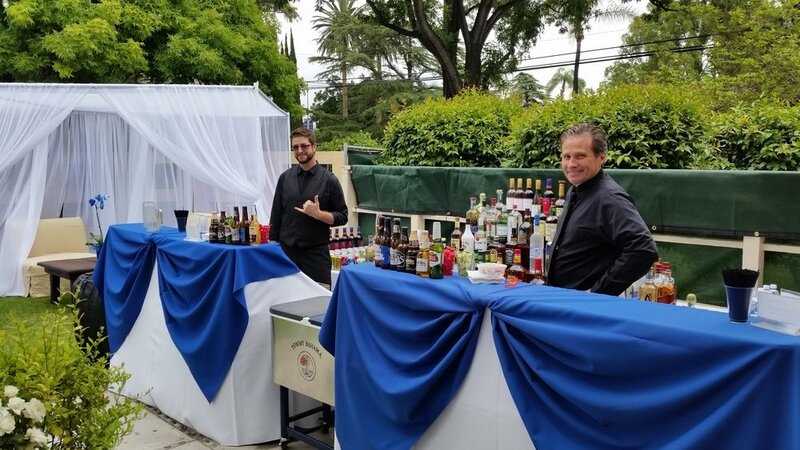 As a fully licensed and insured bar service, DJ's California Catering can provide bar service for your event so guests and attendees may purchase their favorite alcoholic beverages. With a nominal set up charge, this service may be the perfect answer to your event beverage needs. Would you like to supply your own alcohol for your event? DJ's Catering has the perfect package for you. Our basic bar service package includes unlimited soft drinks and bottled water, clear plastic cups and all the ice you will need - all this for one convenient price per person. We supply tubs and ice chests and our bartender will chill and organize the alcohol you supply for service. Do you need bar mixtures and garnishes for a full bar? We can supply those as well for an additional convenient price per person. As an experienced catering company, we have been asked to perform additional services (not mentioned above) to help create the event of the client's dreams. Whether that dream includes a mocktail bar at a bar/bat mitzvah, a mimosa bar for a bridal shower, or special signature cocktails for a wedding reception, please don't hesitate to inquire about these services. Select a Bar Design to Match your Event's Theme!